Abraham Lincoln is widely considered to be America's greatest President. His assassination in 1865, at the end of the American Civil War, plunged the nation into deep grief. Nonetheless, his twenty day funeral procession, which mirrored in reverse his triumphal 1860 post-election journey to Washington D.C., allowed millions of Americans to connect personally, if briefly, with their fallen president. Abraham Lincoln (1809-1865) served as the 16th President of the U.S. and led the nation through the American Civil War. Under his leadership the Union was saved, slavery was abolished and civil rights for African Americans began to become a reality. 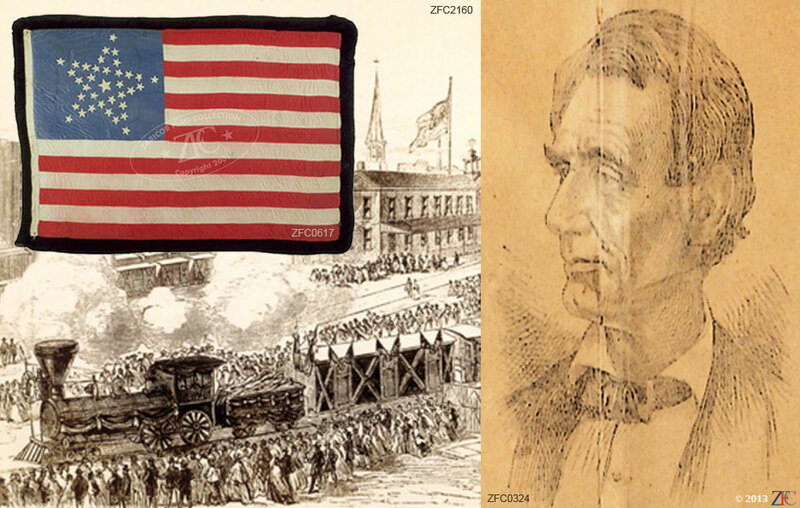 Flags were pervasive during the mourning period and flags and ephemera associated with the mourning and remembrance of Lincoln provided a perceptible link with our greatest president. This grouping captures the only way many Americans could reach out and touch their slain President, through both personal expressions of grief and public commemorations. Included here are several flags displayed both by private citizens and public institutions. So great was the demand for flags during the 20 days of Lincoln's funeral that 37 star flags made in anticipation of statehood for the Nebraska Territory were pressed into service even though statehood was still many months in the future.